Parenting is not easy and we often get exhausted, tired and the complaint list is long like not getting time to rest & relax, kids not listening, not studying properly etc. But as a parent, we need to understand some basic things. 1. Kids are kids, they are small, immature and they can’t behave like adults. 2. We need to bond with them emotionally so that we can understand what they want and then it will be easier to train them the way we want. In spite of doing all this still, there are moments and times when things don’t work the way we want. So in this post, I will share some tips on how to deal with such situations. Being strict is good but we need to friendly at the same time so that they can share everything with us. Some parents are so strict that kids don’t open up in front of them and then there is a huge generation gap between the two. Sadly many parents don’t know and understand what their child wants. So Be their Best Friend. I am doing so and it really helped me to gel with them. 2. I really don’t like when parents are too nagging. Everyone needs some space and Me Time. If we will be on their head always, giving instructions and nagging them constantly, it will hamper their growth and will bring negativity in their behavior. But sadly in India, Parents are mad after marks in exams, so we give unnecessary stress to our children to be a book worm and score high in exams. We do not realize that knowledge is not confined to books only, it’s beyond that, it’s more in the real-life experiences. So the second tip is Stop Nagging. Help them, encourage them but don’t nag. Let them enjoy their childhood and let them be happy from inside. Then in normal situations, parents lose their cool, shout at them, scold them, punish them. But Hey stop doing all that. As that would do more harm than good. What I do in such situations is Stop Interacting With Them for Some Time. This could be a few hours or a day, I don’t talk much with them and keep myself busy with my work or sleep or go out alone, ignoring them totally so to make them feel that I didn’t like the way they behaved, No hugs & Kisses, no special menus, no pocket money etc. Eventually, they get my message and understand that mama is not liking their behavior, they need to say sorry and change. Within 2-3 hours they say Sorry, start obeying me like anything and to make me happy do what I say. So tip number 3 is When kids misbehave Stop Interacting With Them. 4. Show them that your love for them is Unconditional. All parents love their kids but don’t express and they don’t realize it’s importance. We need to express it too. We need to give warm hugs to our kids and make them feel it’s warmth. By small actions, we need to show them that our love for them is unconditional. Even if they are not good at a few things we love them. Success should not be measured by their marks or winning something in sports or activity. It’s by their behavior & nature. We should inculcate Humanity, Kindness in them and they are successful. Regarding academic performance and carrier, with time everything falls in place and is good. It’s more important to make a kind and confident one. Make them feel that they are good enough to be loved and taken care of. 5. Last but the most important tip is to Pray for them. Prayers are something which can change life and destiny and I believe it. As a parent, we are doing our part, working so hard for our kids but there are few things which are not in our control. So pray for your kids. Pray for their wellbeing, for their success, for their happiness. It gives strength even in tough times. So these are my #MomologyTips to make things work my way. This post is a part of Momology blog train by 4 bloggers. I would like to thank Disha of http://lifemyway.in for introducing me to this blog train, do check her blog and post in this series. I would like to introduce Gunjan of https://www.tuggunmommy.com/ as the next stop of this blog train, do check her post in this series. Do leave your views on this topic in the comment section. Good tips on how to raise a child. Yes every kid is different, so every parenting style has to be according to the nature of the child. I liked the last point the most. We underestimate the power of praying for our kids. But my mother tells me that she has always included special prayers for us in her routine. Now I have stopped talking to my kids when they misbehave. They get the message in sometime and things are better. It keeps me sane and guilt free. Parenting is a lesson at each phase. And you improve from your own experiences. 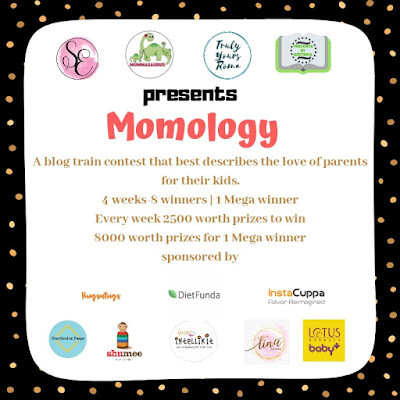 Thank you participating in momology blog train contest.